Lincolnshire man Andrew Pearce spent 8 days trekking across the world’s hottest desert in a bid to raise money for the Lincs & Notts Air Ambulance. Andrew, who is a Trustee of the Charity, has completed a number of treks over the years, and this November he added the Lut Desert in Iran to his list. He joined 8 others as they were guided on foot through a 220km maze of dunes and salt plains in the blistering heat. Not all participants managed to complete the whole distance as the team travelled between 25 to 30km daily, walking from 6am to 4pm through the breathtaking beauty and virtually untouched wilderness carrying up to 15kg of water and equipment. Aptly called ‘the Pole of Heat’ by NASA, the Lut Desert has been measured at temperatures as high as 71 degrees Celsius, which is the hottest ground temperature recorded on Earth. 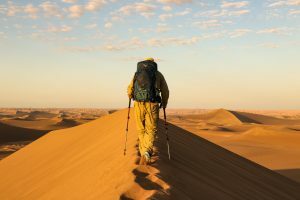 The desert, which is located in the provinces of Kerman and Sistan and Baluchestan in Iran, has only ever been crossed by foot a handful of times, with the first crossing taking place just three years ago. Marco Polo is alleged to have visited the region by camel in 1271, and Wilfred Thesiger visited in 1964. 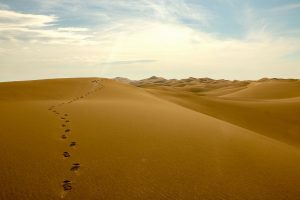 Pictured: Footsteps through the sand as Andrew Pearce travels by foot through the untouched desert. Andrew is no stranger to a challenge. He has completed an array of challenges over the years, which include trekking to the North and South Poles, taking part in the first winter ascents of the highest mountains within the Arctic Circle, and the exploratory attempt to climb four volcanoes in The Democratic Republic of Congo – all to raise money for his local Air Ambulance Charity. 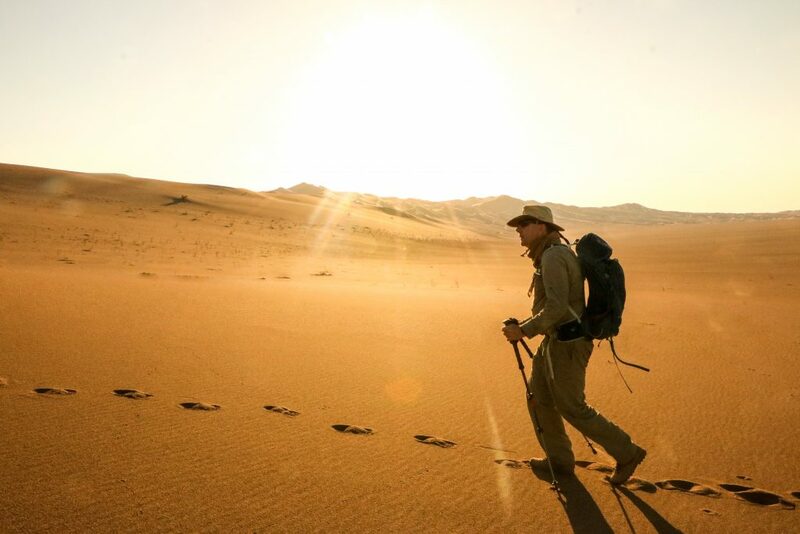 Following his most recent trek across the Lut Desert, Andrew said: “It was a real privilege to have been able to visit this untouched corner of the world and it was a contrast to the cold and ice of the Artic and Antarctica. Thankfully, we were travelling in much cooler temperatures than the 70 degrees plus that has been recorded in the past. Pictured: Andrew Pearce tackles the maze of dunes and salt plains in the blistering heat. In recognition of his extensive exploration, Andrew has recently been accepted into the prestigious international Explorers Club. Andrew is one of only a handful of people in the world who have been granted membership in the last year. Famous honorary members have included Theodore Roosevelt, Jim Fowler, Prince Philip, Duke of Edinburgh and Albert I, Prince of Monaco. The Club’s members have been responsible for an illustrious series of famous firsts: First to the North Pole, first to the South Pole, first to the summit of Mount Everest, first to the deepest point in the ocean, and first to the surface of the moon. Throughout his adventurous expeditions, the chartered surveyor has been accompanied by his very own cuddly companion, George the Lincs & Notts Air Ambulance Bear. From the jungle to the mountains, through the ice and now the desert, George has travelled the world for more than 12 years with owner Andrew, who has snapped many photographs of his beloved bear along the way. 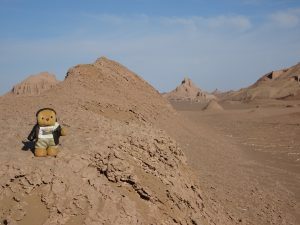 Pictured: George the Lincs & Notts Ambulance Bear poses in the Lut Desert. Karen Jobling, Chief Executive Officer at Lincs & Notts Air Ambulance, said: “Andrew has achieved so much over the years and we are all in awe of his latest expedition success! We are extremely grateful for his outstanding fundraising efforts to help raise vital funds for our Charity. “As we begin to transition to flying 24/7 operations, we face the challenge of raising £4 million every year to keep our helicopter in the sky. We quite literally could not provide our vital emergency medical service without the help and continued support we receive from generous individuals like Andrew. There’s still time to make a donation by visiting Andrew’s Virgin Money Giving page at uk.virginmoneygiving.com/AndrewPearce19. WANT TO TAKE PART IN YOUR OWN CHALLENGE? As a key part of the Lincs & Notts Air Ambulance’s 25th Anniversary celebrations next year, the Charity will be helping individuals to experience their own life-changing moment by joining their first ever Sahara Trek Challenge in September 2019. The Charity is looking for 25 participants to take part in the 100km trek – one participant for each year the helicopter has been flying. If you’d like to take part in next year’s Sahara Trek, or would like more information about the event, visit www.ambucopter.org.uk/saharatrek.